NASA has beefed up a process of traffic monitoring, communication and maneuver planning to ensure that ‪#‎Mars‬ orbiters do not approach each other too closely. Last year’s addition of two new spacecraft orbiting Mars brought the census of active Mars orbiters to five, the most ever. MAVEN and ISRO’s Mars Orbiter Mission joined the 2003 Mars Express from the ESA – European Space Agency and two from NASA: the 2001 Mars Odyssey and the 2006 Mars Reconnaissance Orbiter (MRO). The newly enhanced collision-avoidance process also tracks the approximate location of NASA’s Mars Global Surveyor, a 1997 orbiter that is no longer working. It’s not just the total number that matters, but also the types of orbits missions use for achieving their science goals. ‪#‎MAVEN‬, which reached Mars on Sept. 21, 2014, studies the upper atmosphere. 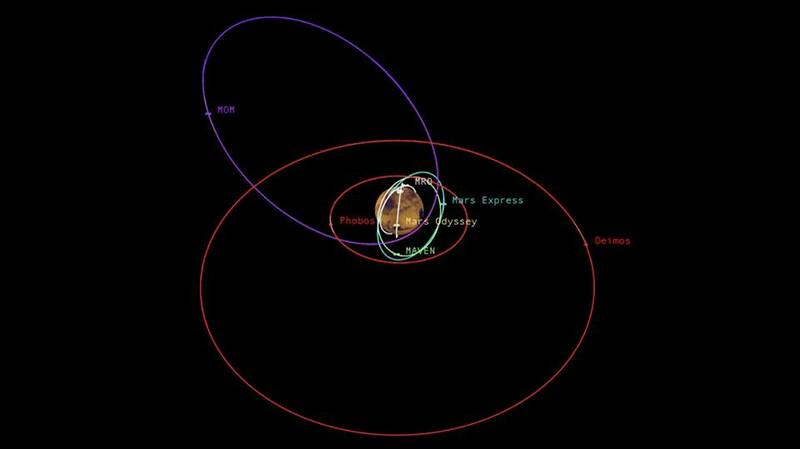 It flies an elongated orbit, sometimes farther from Mars than NASA’s other orbiters and sometimes closer to Mars, so it crosses altitudes occupied by those orbiters. For safety, NASA also monitors positions of ESA’s and India’s orbiters, which both fly elongated orbits.